Amazon seriously hopes to conquer the fashion and apparel market. In the first 23 weeks of the year, Amazon.com Apparel sales amounted to $1.45 billion, a 15% YoY increase from 2016. Traditionally, clothing and fashion accessories have been complicated to purchase online. But now, Amazon’s latest move, Prime Wardrobe, lets shoppers try on clothes and return them for free. These kinds of innovations are precisely why the online retailer continues to gain loyalty among digital consumers. One Click Retail’s latest report looks at Amazon’s place in the U.S. apparel market, and identifies some emerging trends. “The Amazon Effect” series breaks down specific product groups, compares Amazon’s performance in that category to total retail sales (online and offline) and considers the effect Amazon has on that specific industry as a whole. 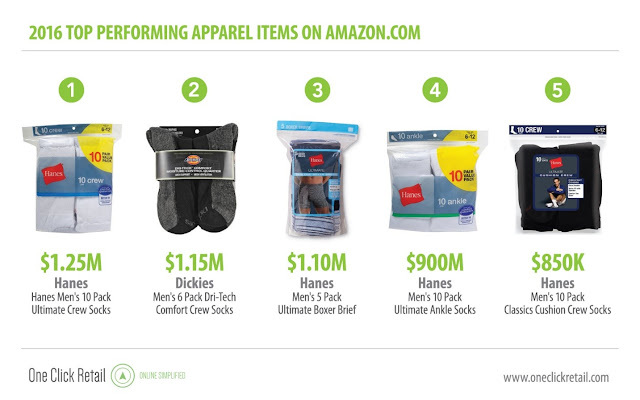 In this latest edition, we explore the impact of Amazon on the Apparel market. The United States has the largest apparel market in the world. As apparel dollars continue to shift from brick-and-mortar stores to online channels, the outlook for physical retailers is grim. The apparel industry has seen its share of the total digital spend grow over the past three years, from 15.4% in 2013 to 17% in 2016. Nevertheless, purchasing fashion and apparel items online can still be complicated: take for instance someone who orders their prom dress from China; what they think they are buying vs. what they receive is often unmatched. As e-commerce transactions progressively become the norm, online retailers must respond to growing consumer demands for seamless, reliable shopping methods and, unsurprisingly, Amazon is leading the way. Amazon has serious designs on capturing the fashion and apparel market. 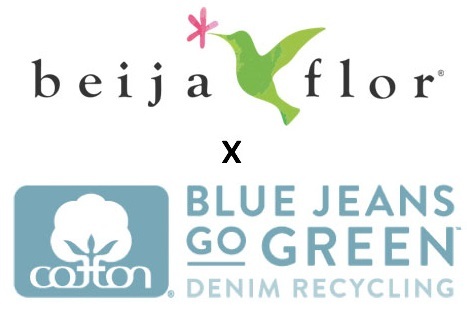 The company has been ramping up its investment in the sector, with initiatives such as the development of its own private-label clothing brands, and most recently the introduction of Amazon Prime Wardrobe. Currently in beta mode, the service will let shoppers try on clothes and return them for free, an initiative designed to seduce more brands into Amazon's marketplace. • $200 billion: The total value of 2016 U.S. Apparel sales. 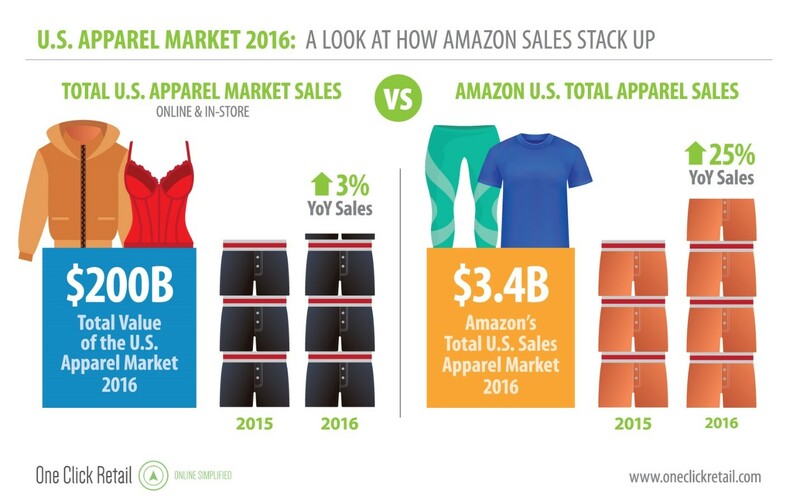 • $3.4 billion: Amazon.com’s total 2016 Apparel sales. • 3%: The YoY growth of the U.S. apparel market. • 25%: The YoY growth of Amazon.com’s Apparel sales. 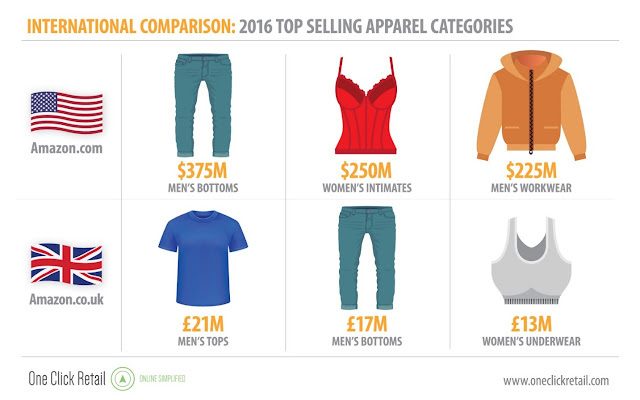 Of the top performing Apparel categories on Amazon for 2016, three involve men’s clothing. A traditionally female-driven activity, online apparel shopping is luring a new male demographic. It's easy to see how Amazon’s hassle-free shopping efforts would attract men who avoid stepping into a clothing store (instead relying on their wives or mothers for new underwear). We see a similar trend with the popularity of Women's Intimate Apparel: women (and gift-buying men) who feel awkward buying lingerie at brick-and-mortar retailers are now going online instead. Our data suggests a trend in Apparel where companies and categories dominate by having a large number of items with lower levels of sales as opposed to having high-selling items. 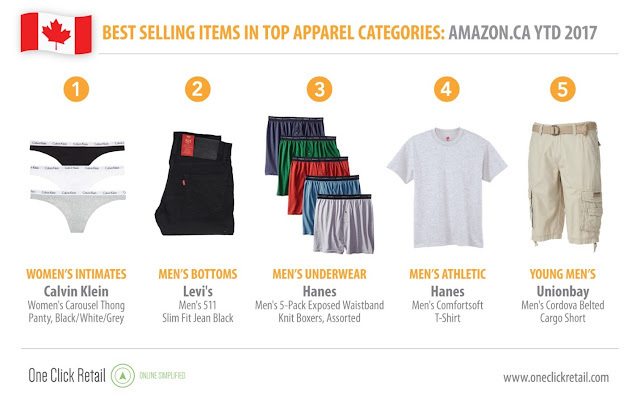 This is illustrated with men’s underwear and socks which make up many of the top selling items, but are rarely if ever in the top 5 categories, while the top selling categories include none of the top items. Hanes, for example, has incredibly high sales in the Men’s Underwear product group, holding 3% market share in 2015, which has already grown to 5% market share today. Apparel and footwear sales have seen a relatively slow growth rate since the economic crisis in 2008, with an increase of only 3.8% worldwide, bringing the total value to $1.67 trillion. Formalwear has also been in decline. As the population shifts away from restrictive dress codes towards a more casual lifestyle (considering the increased flexibility of working from home for example), the need for formal work attire is gradually diminishing. Consumers are increasingly opting to wear sports apparel and athletic footwear for numerous daily activities, from working out at the gym, to running errands and working from home. The sportswear category (items such as yoga pants and activewear) has the highest year-over-year global sales growth with an increase of just under 7% in 2016, outpacing all other categories for the third year in a row. 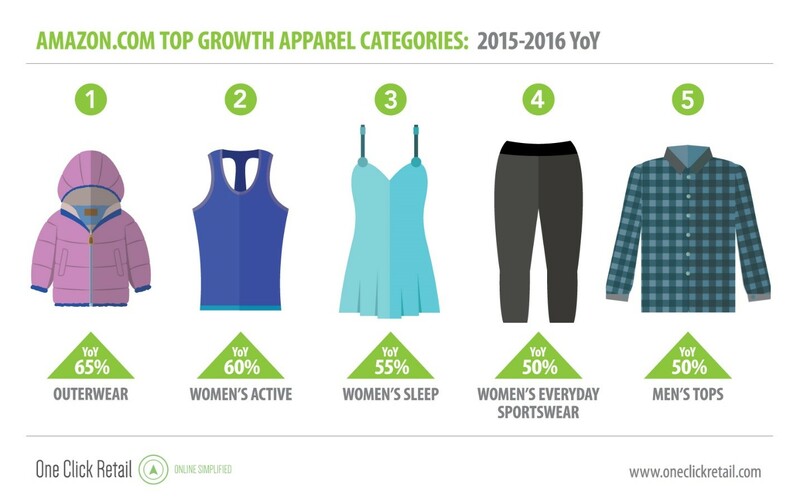 Looking at Amazon’s ‘Top 5 Growth Apparel Categories’, we notice that this casualization of dress norms, known as the athleisure trend, is apparent. Comfort and athleticism are becoming the major influencers behind today’s apparel design. And as we explored in our analysis of Outdoor & Sporting Goods, athletic apparel is a product sector that is experiencing great success in e-commerce, with a disproportionately high share of consumers choosing Amazon over brick-and-mortar stores. So far in 2017 there has been no major change in the U.S. sales trends. 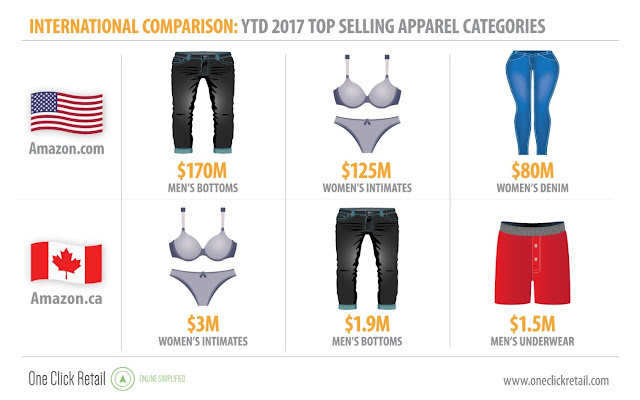 In the first 23 weeks of the year, Amazon.com Apparel sales amounted to $1.45 billion, a 15% YoY increase from 2016, which leads us to project an estimated total 2017 Apparel sales of $3.9 by the end of the year. One interesting phenomenon is that the single best-selling item in 2017 so far is the Jurassic World T-Rex Inflatable Costume from Rubie's Costume Co., despite the fact that we're still a long ways from Halloween. A number of factors could be responsible for the success of this item: it's relatively new (only released late 2016), it's exclusively available online while most other top items can be purchased in-store, and it's quite a bit more expensive than the other top items, mostly socks and underwear, so it can rank higher even if actual sales figures are lower. Rubie's T-Rex costume also ranks very highly in Canada, actually earning more than four times the sales value of the second-bestselling item YTD in 2017. In this and in other ways, Amazon.ca is performing very similarly to Amazon.com, with Canada's top three product categories appearing in the U.S. top five and the majority of top-selling individual items being socks. Shifting over to our UK findings, apparel on Amazon.co.uk had £125,000,000 total sales. Based on our 23-week year-to-date (YTD) numbers, we noticed a 15% increase in YoY sales from £46,000,000 in 2016 to £52,000,000 in 2017. 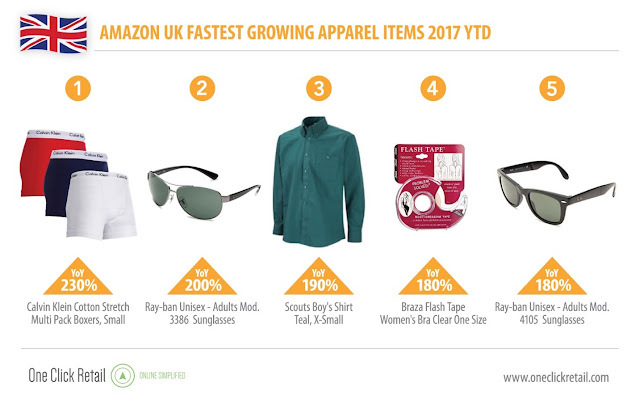 Anticipating the hot summer days ahead, the fastest growing items (when comparing first 23 weeks 2016/17) include: men’s underwear, driven by Calvin Klein Cotton Stretch Multi Pack Boxers with a 230% growth rate, followed by men’s accessories, specifically Ray-ban Unisex - Adults Mod. Sunglasses, gunmetal with 200% growth and boy’s tops Scouts Boy's Shirt Teal X-Small at 190% growth. In both the US and UK, the men’s underwear category is performing highly on Amazon, however, Americans clearly prefer Hanes whereas Calvin Klein is the undisputed favorite in the UK. For the past 25 years, Calvin Klein’s signature logoed underwear have been popular among men and women due to its combination of timeless black and white advertising with monochromic designs and of course, good quality cotton. Recently, however, the brand’s smart social media campaigns have catapulted its underwear collection into a new realm of prominence (which can be seen in our data). The original #MyCalvins campaign endorsed celebrities, models and bloggers with the classic Calvin Klein logo underwear and encouraged recipients to post half naked photos of themselves in the garment on Instagram. Naturally, the public quickly followed suit, posting their own #MyCalvins photos, and the rest is history. Amazon still struggles in the luxury brands category since many refuse to sell on Amazon due to the platform’s lax knock-off policies. Despite this, our data shows that the company is having great success with necessities and everyday items such as jeans, socks, underwear and men’s work clothes. In their efforts toward a hassle-free shopping experience, Amazon is investing in innovation: in payments, order fulfillment, product selection and now, with Amazon Prime Wardrobe, return policy flexibility. For these reasons, Amazon continues to gain loyalty among digital consumers, and One Click Retail will be closely monitoring any and all future developments with Amazon in the apparel market, eager to see how digital shoppers respond to these initiatives and when the next market transformation will occur. The article above was provide by One Click Retail. One Click Retail is the industry's most accurate source of sales data for the world's top eCommerce marketplaces. With 98% accuracy, OCR delivers the best insights, analytics and strategies to their brand manufacturer clients, giving them a critical edge on online platforms. To catch a glimpse of the unique data and expertise OCR provides to its customers, subscribe to our weekly eCommerce insights blog, and follow us on Twitter and LinkedIn. Learn more about Amazon Prime Wardrobe here on the Apparel Search fashion blog.